Copyright © 1990-2005 by DisplayMate Technologies Corporation. All Rights Reserved. This is Part III of a four part article series describing an in-depth comparison between CRT, LCD, Plasma and DLP display technologies in order to analyze the relative strengths and weaknesses of each. In Part I we measured, analyzed and compared primary specs like Black-Level, Color Temperature, Peak Brightness, Dynamic Range, and Display Contrast for each display technology. Click this link to read Part I. In Part II we continued with Gray-Scale, Gamma, Primary Chromaticities and Color Gamut to see how they all affect color and gray-scale accuracy. Click this link to read Part II. Here in Part III we continue with the complex world of display artifacts and how they affect image quality. In Parts I and II we measured the photometry and colorimetry for each of the displays. If all of the pixels in a display performed in exactly this manner, there wouldn’t be anything more to discuss because images are just made up of pixels. The whole would just be the exact sum of its parts. Unfortunately, things aren’t quite that simple because a considerable amount of processing is required between the image or signal source and the actual display device. All of this processing affects and modifies what each pixel winds up displaying, often adversely affecting image quality and accuracy and frequently introducing artifacts into the image. An artifact is simply any distinct feature that is visible in an image that doesn’t belong there. 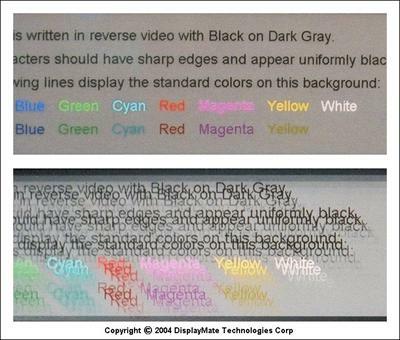 How the different display technologies respond to these issues will be the subject of Part III. While artifacts frequently arise when an image or signal is encoded or compressed for storage or transmission we will be focusing primarily on artifacts that result from the displays themselves. Compression artifacts are a vast subject in their own right that we will be touching upon only lightly. First we’ll consider the question of Analog versus Digital for intensities, pixels and signals. Then we’ll examine Signal Quality and Accuracy, followed by discussions on Native Resolution and Image Rescaling, Image Noise, Motion Artifacts and Signal Processing. The discussion in Part III will deal primarily with broad issues that affect all of the display technologies together. The discussion for many specialized artifacts that apply to only one particular display technology will be considered under the detailed individual technology assessments in Part IV. Three fundamental issues for any display are the way in which it generates pixels, produces intensities and processes input signals. Each one of these can exist in either the analog or digital domains. The terms analog and digital encompass a wide variety of contexts. Generally analog refers to anything that can take on any continuously variable value, while digital refers to anything that can only take on a discrete set of enumerated values. Analog is smooth but imprecise and digital has jumps but is perfectly precise. Within each section we will further explain and define these meanings. While most people assume that digital is somehow automatically better, that really isn’t the case. Each method has its own particular advantages and disadvantages, either one can produce excellent image and picture quality, and either one can be superior to the other. It’s the details of the implementation that determines the quality of the end result and the artifacts that are produced. We’ll explore these issues next. The intensity (brightness or luminance) of a display pixel can be controlled by either an analog or digital process. Each display technology must do it in a particular way. While any display can accept both analog and digital signals, they must be converted into the proper native mode by the time they get to the actual display device. Both CRTs and LCDs produce their intensity scale through analog voltage control of the device. The range of brightness that is produced is both perfectly smooth and infinitesimally graduated. Some signal processing may be necessary in order obtain the desired Gamma or gray-scale, as discussed in Part II. If it’s all done via analog circuitry then the display retains its pure analog nature, which means that it’s free of intensity artifacts (see below) but is susceptible to degradation in signal and image quality. On the other hand, both Plasma and DLP displays have only digital on and off pixel states so they must produce their intensity-scale digitally by rapidly switching between the two states and varying the percentage of time that is spent in each state. If the switching frequency is high enough then the eye responds to the time-averaged brightness of the pixel. For example, for 25% brightness, a quarter of the time is spent on and the other three-quarters is spent off. In principle, it’s possible to produce an infinitesimally graduated intensity scale just like the analog devices above. In practice the switching frequency is fixed and the states are digitally controlled so only a discrete set of intensity levels can be produced. As a result the intensity scale is no longer smooth but rather increases as a series of steps. The resulting jumps in intensity produce what is known as a quantization error because all intensities are forced up or down to the nearest available digital value. If the steps are very fine then the eye will not notice the lack of intermediate values and smoothness. If they’re not then artificial intensity and color contours (which are artifacts) may be visible in the image, particularly at lower intensities (see below). Since most signals are now digitally generated (including almost all analog signals) there is already a quantization error built-in to most images. We’ll discuss this further below. At low intensities the on-time is so brief that it may be visually perceived as image noise. (See Image Noise and Temporal Dithering, below). In most consumer devices the goal is to produce 256 intensity levels (8-bits per primary color or 24-bits total). Signal processing generally reduces the total number of levels that are actually available, so in reality less than 256 levels are provided. This introduces additional gray-scale artifacts that we’ll discuss further under Signal Processing, below. The pixel structure of the display can also be either analog or digital. This is determined by either the inherent nature of the display technology or the implementation chosen by the manufacturer. DLP and Plasma displays have an intrinsic discrete pixel matrix format that is fixed at the time of manufacture and cannot be changed. Each DLP pixel is made up of a micro-mirror and each Plasma pixel is made up of 3 gas cells that contain red, green and blue phosphors. This discrete image structure is referred to as digital pixels (or discrete or fixed pixels). Each digital pixel has a unique digital address on the display. There are many competing advantages and disadvantages to this approach. Digital pixels are generally organized in a regular matrix of horizontal rows and vertical columns. As a result the screen is tiled in a repeating structure of squares or rectangles that have a uniform internal brightness. This structure can become quite noticeable in some images. This effect is called Pixelation. Gaps between the pixels make pixelation more apparent. This is called the Screen Door Effect because of the similarity to looking through the mesh screen on a storm door. The gaps are noticeable in Plasma and LCD technologies but almost invisible for DLP (and LCoS). The higher the display resolution the less apparent pixelation becomes. At 1920x1080 it’s generally invisible at typical viewing distances, but it can be a factor at lower resolutions, such as 1280x720. CRTs as pure analog devices don’t have any preordained pixel structure built in so they are free to support a very wide range of image formats. The phosphor dots or stripes in direct-view color CRT monitors do introduce a grain into the image and can produce wispy moiré interference patterns (similar in appearance to what you see when looking through two layers of semi-transparent thin fabric, which is discussed further in Part IV) but they don’t impart any particular pixel structure. CRT projectors use CRTs with smooth phosphor coatings so they don’t produce any moiré artifacts. Technically CRTs are pixel-free, but this lack of structure is still referred to as analog pixels (or continuous pixels) because they can be thought of as formed and stretched in whatever way is necessary. For example, if you have a CRT monitor connected to your computer then you can select from a wide variety of resolutions that will be accurately reproduced without any pixel or rescaling artifacts. The above is not the entire story because virtually all CRTs are operated in a mode where images are made up of a specified number of continuous horizontal lines, which is called a raster. The raster is actually a property of the image structure rather than of the CRT itself, which in principle will accept whatever line structure is delivered to it. So images on a CRT are actually analog horizontally but digital vertically because of the image line structure. When the CRT’s beam size is properly adjusted the raster is virtually invisible, but that doesn’t always happen, especially with CRTs that support multiple resolutions. LCDs are also analog devices and don’t have any intrinsic digital pixel structure (because they are filled with a uniform liquid crystal layer), but they are generally manufactured with a pixel matrix structure just like the DLP and Plasma technologies. So all of the flat panel technologies behave identically in this regard. However, LCDs are a hybrid technology because they have digital pixels but require an analog signal internally for the panel. The digital structure takes precedence and signal processing for LCDs is generally digital. The signal is the manner in which an image is delivered to a display and also the object of all of the processing that takes place. Most displays now accept both analog and digital signals. In principle, displays with digital pixels prefer digital signals and displays with analog pixels prefer analog signals. Note that the signals are doubly digital or analog: a digital signal has digital pixels with digital intensities and an analog signal has analog pixels with analog intensities. Converting between the two signal types always involves some image degradation and artifacts. An analog signal is transmitted as a voltage, typically ranging between 0 and 0.7 volts while a digital signal is transmitted as a number, generally ranging between 0 and 255. An analog signal has the advantage of not possessing any built-in structure, which makes it artifact free. It can contain a lot more subtle image information than a digital signal, which is constrained to a discrete pixel structure and a discrete set of allowed intensity levels. On the other hand, analog signals by their very nature are easily susceptible to degradation and interference. Just as with audio systems, there are significant differences in performance between components and even subtle differences can have visual consequences. High quality analog signal processing is now more difficult and expensive to implement than digital signal processing (even though the analog electronics are much simpler, i.e., less complex, than the digital electronics), which is why we’ll continue to see more and more of the latter. Analog signals typically come in the form of RGB (separate red, green and blue primary color channels) for computers (via DB15 VGA or BNC connectors) and component YPBPR (separate luminance and encoded blue and red channels) for video (via BNC or RCA connectors). Since analog signals are easily degraded it’s important to use high quality signal sources (graphics boards for computers, and cameras, DVDs, VCRs, and Set Top Boxes for video). Often the biggest differentiator in performance is the quality of the analog electronics within the display itself because of the considerable amount of processing electronics that is required there. We’ll discuss this under Signal Quality, below. High quality cables are also important, particularly for runs longer than a few meters. Long runs of more than 25 meters typically require repeaters with equalization and signal processing in order to compensate for the transmission losses, but distances of 100 meters or more are possible with little overall signal degradation. A digital signal has the advantage of absolute precision when it is generated, transmitted or processed. Still there are limitations and artifacts that result from its discrete nature. We have already discussed some of these and will examine other aspects in the sections below. None-the-less there are many advantages to using digital signals. If both the signal source and display work with digital signals then most of the time it’s better to use a digital rather than an analog connection. There are two reasons for instead picking analog over digital: (1) digital often produces stronger and more visible artifacts, and (2) analog often provides a larger set of controls for adjusting the image. Both of these issues are discussed in detail in the sections below. Digital signals come in the form of DVI (Digital Visual Interface) for computers and DVI with HDCP (High Definition Copy Protection) for video. (There are a number of other digital signal formats in use, such as Firewire, which is also known as IEEE 1394, and SDI and HD-SDI, which are production serial and high definition serial digital interfaces, but they aren't yet found on many displays or projectors.) DVI has red, green and blue channels with 8-bits of intensity information per channel. Note that there is a crucial difference in the signal levels between the different types: computer signals cover the complete 8-bit 0 to 255 range, with 0 for black and 255 for peak intensity, while 8-bit video signals operate over a somewhat smaller range, with 16 for black and 235 for peak white, with the remaining levels reserved to accommodate signals that overshoot this nominal range, and also for synchronization. For accurate image reproduction it’s important that the display provide (automatic or manual) adjustments to accommodate these range differences. (We strongly recommend a manual Black-Level Control, see Parts I and II.) Another issue with DVI signals is that the transmission distance is typically limited to relatively short distances of a few meters (up to 5 meters in some cases), but the distance depends on the resolution and the quality of the signal transmitters, receivers and cable. Beyond that some form of repeater is required. After the maximum recommended distance the image will start to degrade, first in the form of intermittent digital noise artifacts appearing in the image and then by a total loss of signal. Much greater distances are possible: Silicon Image, one of the principal developers of DVI, has demonstrated DVI transmissions of 20 meters at high UXGA 1600x1200 resolutions using chipsets that are specially designed for long cable runs. Even longer runs of 100 meters or more are possible using fiber-optic DVI cables. HDMI (High Definition Multimedia Interface) is the next generation of digital interconnect that is beginning to appear in the marketplace. It is backwards compatible with DVI. From our perspective here it has two major advantages: support for up to 12-bits of intensity (4096 levels) and typical transmission distances of up to 15 meters. (These can be extended with the same methods used with DVI.) This will help to significantly reduce many of the digital artifacts that we discuss here. Other advantages for HDMI include a smaller connector and the inclusion of audio and control signals together with the video signal, so only a single cable is necessary. One issue that occasionally affects DVI (but not HDMI) is the use of components that are not fully compliant with the official DVI specification. This problem arises because official compliance testing is not required for DVI components (but it is for HDMI). When there is a compliance problem some DVI signal sources (like computer graphics boards or DVD players) may not work properly with some DVI receivers like displays. This generally leads to image artifacts like on-screen noise. The problem is more likely to appear at higher resolutions and longer transmission distances. Historically only a small number of combinations have resulted in a problem and it’s less common now. Both analog and digital signals are subject to various types of errors and so they are both unable to deliver perfect image quality and accuracy for different reasons. Video and photographic images always begin in the analog world and almost always need to be converted into digital signals for transmission or storage. Computer generated images that are displayed on DLP or Plasma displays with digital connections are the only images that can remain purely digital end-to-end. Most computer and video hardware are still connected via analog signals so a reverse digital to analog conversion is generally necessary. Most displays are still CRT or LCD based and therefore actually require an analog signal internally at the display device. Also, these displays often include some form of internal digital signal processing, so almost all images spend time in both the analog and digital domains and need to be converted between them at least once, and often more than once. We’ll examine these issues here and in the Signal Processing section below. While digital signals and intensities are absolutely precise they always introduce some brightness artifacts for each pixel in an image. This is due to the quantization error that results from restricting the intensity and brightness values to a set of digital levels, instead of allowing any value in-between the minimum and maximum, as in the case of analog signals. The intensity steps apply individually to each of the red, green and blue primary color channels, so they also introduce quantization errors into hue and saturation for all resulting color mixtures. The greater the number of digital levels the smaller the error. If the steps are very fine then the eye will not notice the jumps and lack of smoothness. If they’re not then the Granularity of the digital steps will introduce false visual intensity and color contours into an image. They’re most noticeable when there are fine graduations in either intensity or color within an image. The real question is how fine do the steps need to be in order for these granularity effects not to be visible? As we discussed in Part II, the eye responds to brightness ratios. (Technically the correct term to use here is luminance ratios, but we will be informally referring to luminance as brightness and will use the two terms interchangeably throughout the article.) When comparing two values it is their brightness ratio that determines what your eye sees. So how small a variation in the brightness ratio can the eye detect? It turns out to be roughly 1 percent over a wide range of brightness. So if the change in brightness between two digital intensity steps is more than about 1 percent, then the brightness granularity can be detected by the eye. The number of intensity steps that are available is determined by the number of bits used to specify the intensity levels. For example, 8-bits allows 256 levels, which is what is used in most computer and video signals. A greater number of bits will provide a finer intensity scale, which is sometimes used for internal signal processing within a display (see Signal Processing, below). HDMI will eventually allow up to 12-bit signals, which has 4096 levels, but for now most computer and video content is restricted to 8-bits and 256 levels. The next question is how to distribute the brightness levels among the allowed digital values. The best (and most efficient) way would be to separate them all by a specified ratio, like the one percent increment mentioned above. Each step would then be 1.01 times the brightness of the previous step. Each step would also be a bit wider than the previous step, so the spacing between the steps would vary and be non-linear. (The brightness for step n would be proportional to 1.01n. Black, which has zero brightness, is handled as a special level.) This is the most efficient method for specifying the intensities accurately, but it’s not the method that’s used because a linear spacing is more convenient and makes signal processing a lot easier. So, in reality, the intensity steps are all separated by equal differences rather than equal ratios. That means that the brightness ratio between adjacent steps will then increase as the brightness decreases, so the granularity artifacts will show up first at the dim-end of the intensity scale. We’ll analyze this quantitatively next. In Figure 1 we’ve plotted the percentage change in brightness per digital step from an 8-bit intensity scale (with 256 steps) up through a 14-bit scale (with 16,384 steps). They’re all plotted as a percentage of maximum brightness on the horizontal scale. We’ll discuss the meaning of the 7-bit graph below. (The plotted values depend on the value of Gamma, so we’ve used the standard value of 2.20, see Part II.) We’ve again used a logarithmic graph because it’s better for presenting the results. You don’t need any advanced math to understand logarithmic graphs, just pay attention to the scale values. The horizontal axis goes from 0.1 percent to 100 percent of the maximum screen brightness -- that’s a dynamic range of 1000:1 in brightness. The vertical scale goes from 0.01 percent to 100 percent. Note that a 1 percent increase, which is the detection threshold, is exactly in the middle of the vertical scale. Values below this value cannot be detected by the eye and values greater than this value can be detected, and therefore may produce false intensity and color contours in an image. From the graph you can see that almost the entire 8-bit intensity scale is above the one percent detection threshold. Also, the granularity dramatically increases by more than a factor of 20 over the brightness range shown in the graph. At 10 percent of maximum brightness the change in brightness between adjacent steps is 2.5 percent and at 1 percent of maximum brightness the change is 7 percent between adjacent steps. There is plenty of image content that extends down to 1 percent of maximum brightness (level 32), so the granularity and contouring will definitely be visible in an 8-bit intensity scale. The graph extends down to 0.1 percent of maximum brightness, which represents a dynamic range of 1000:1. CRTs have a dynamic range that’s more than a factor of 10 greater than that and the best flat panels are now approaching 3000:1 and are steadily improving. 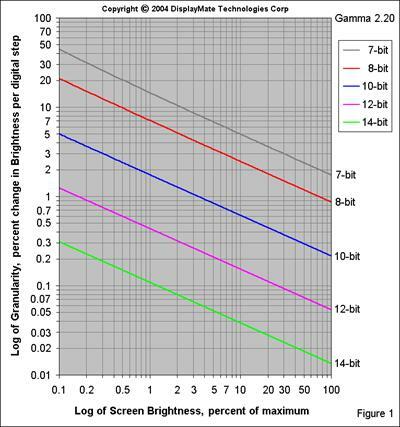 At 0.01 percent of maximum brightness (not shown in the graph but corresponding to a dynamic range of 10,000:1) only the 14-bit scale is below the one percent threshold. However, at very low light levels the detection threshold for the eye will increase. So, in order to take full advantage of the larger dynamic ranges for the current generation of displays it will be necessary to extend the intensity scale by at least two more bits over the current 8-bits. Hardware that’s capable of handling 10 and 12-bit signals is starting to make an appearance and will significantly reduce granularity effects in the long-term, however, for now almost all image content is based on 8-bits. A detection threshold is probably much too stringent a condition, so we should instead be looking for something more along the lines of a noticeable threshold, which is around a few percent, but will depend on the particulars of the image content and the ambient lighting conditions. For example, contouring will be much more noticeable in a dark image when viewed in a very dark room. With any version of DisplayMate for Windows (www.displaymate.com) you can determine the threshold values for yourself using the “Color Explore and Match” test pattern screen, which has 3 side-by-side panels that can be set to any 8-bit intensity or color value. First set the slider for the middle panel to the intensity or color value that you want to study. Then adjust the sliders for the other two panels to values just above and below the central panel where you start to detect an intensity or color difference. That will be your eye’s threshold for that intensity or color. The DisplayMate Multimedia Edition has additional test patterns to help determine gray-scale sensitivity. To perform these tests you’ll need to use an analog CRT display because all of the other technologies generate their intensities digitally, which will interfere with the experiment. (The CRT uses an analog signal generated from the 8-bit digital signal. The conversion is generally very accurate and should not interfere with the evaluation.) Turn down the room brightness as low as possible, or at least down to the same value as your home cinema and make sure that your computer is set to 24-bit color (sometimes it’s identified as 32-bit color), which uses 8-bit intensities. The granularity effect is actually larger than the above discussion because with an 8-bit digital input signal it’s unlikely that a digital display will be able to produce a true 8-bit intensity scale. The reason is that any digital processing will cause some reordering of the perfectly ordered set of 256 intensity levels. A shift of just 1 intensity level will degrade the signal to 7-bit granularity (see Figure 1), a shift of 3 levels will degrade the signal to 6-bits, and a shift of 2 levels falls in-between 6 and 7-bits. One way to reduce this effect is for the display to process the 8-bit signal internally with more than 256 levels; 10-bits with 1024 levels is used in many displays. It’s a form of digital interpolation. The processing irregularities (artifacts) are then smaller. If the display device can actually produce 1024 intensity levels then it will deliver overall performance relatively close to 8-bits. If the display device is limited to 8-bits (which is often the case), then the overall performance will be closer to 7-bits. If straight 8-bit signal processing is used throughout then the overall performance will typically be closer to 6-bits. We’ll discuss this further under Signal Processing, below. A video analog signal behaves exactly like an audio analog signal. Its primary strength, which is its ability to carry very minute and subtle details, is also its primary weakness because it is susceptible to very minute and subtle variations and degradations in performance that can easily affect visual on-screen image quality. While there are an almost endless set of possibilities as to how an analog signal can degrade the most common problem is a loss of sharpness and fine image detail due to shortcomings in high-frequency response, which is called Video Bandwidth. It can originate with the signal source like a DVD player or a computer graphics board or in the display’s own signal processing electronics. The higher the screen resolution the greater the video bandwidth that’s needed. If there is insufficient bandwidth then fine image detail will appear dim and blurry. It takes very high quality engineering and components in order to be able to deliver excellent analog high-frequency response and there are substantial variations in performance between different units. DisplayMate for Windows Multimedia Edition includes a proprietary DisplayMate test pattern that accurately and numerically measures video bandwidth on-screen using only your eyes (no instrumentation is needed). It works by adjusting an on-screen slider so that a checkerboard pattern of high and low-frequency components appear equal in brightness. The measurement is on a scale of 0 to 100, with 100 as perfect. Scores greater than 100 are also possible, but this is a tell-tale sign of over-peaking, where the high-frequency response is set too high in order to artificially enhance sharpness in poor quality hardware. Another issue with analog electronics is that the red, green and blue primary color channels need to all have identical performance in every respect. In particular, if the video bandwidth for the RGB channels are not identical then high-frequency fine image detail will be produced with an unbalanced set of RGB primaries, which will introduce color errors, including a different white-point chromaticity (Part II) for fine detail. DisplayMate for Windows Multimedia Edition includes a very sensitive test for this effect. Transient Response is another performance criterion that's related to video bandwidth. It describes how quickly and accurately the analog signal changes when going from one pixel to the following pixel, and therefore has a major impact on image sharpness. In principle the signal amplitude needs to change quickly (the rise-time or fall-time) and also change smoothly and accurately between the signal levels for adjacent pixels. It's quite a challenge to make this happen, especially at high resolutions, and a fair amount of circuit tweaking is often necessary. Peaking circuits are used to improve the rise-time and frequency-response while filtering circuits are used to reduce undesirable signal irregularities. Each one also produces undesirable side effects: peaking produces signal overshoots that add over-bright or over-dark Edge Artifacts to fine image detail and also Ringing Artifacts that add one or more oscillations in brightness that follow fine image detail. Filtering does the opposite and dampens and slows down signal transitions. Both elements are needed and they work together in an opposing compromise. Another important issue is that the amplifier gains and the Gammas for each primary color channel must be identical. If not, then the gray-scale will exhibit variations in color with intensity. This and many other signal quality aspects can be examined with the extensive suite of test patterns provided within all DisplayMate products. When an analog signal is fed to a display with digital pixels, it needs to be digitized. Since almost all analog signals are actually generated from digital sources (computer or MPEG) it’s necessary for the display to accurately identify the underlying digital pixels within the analog signal and then accurately measure the signal level at the center of each one. Otherwise the transition region that exists between pixels will be digitized, which is highly variable and will appear as on-screen noise. First of all, it’s very difficult to accurately locate the beginning and end of each pixel because they generally don’t have well-defined edges. If it’s not done with 100% accuracy there will be visible on-screen interference in the form of moiré interference patterns and digital noise, which arise because the image pixels are not all being properly identified and mapped to the appropriate display pixels. As a result the digital image actually becomes a bit fuzzy (much like an analog CRT). It’s rather difficult to perform an accurate conversion because the start and end of each signal pixel is difficult to identify and there are often problems with signal quality, such as rise-time, overshoot and ringing, which makes it difficult to accurately measure the true intensity of each pixel. Digital clock jitter and drift over time make this problem even harder. Other factors include the accuracy of the signal level measurement hardware and the number of digital levels that are generated, which is called the bit-depth, and is normally between 8 and 10 bits, but it can effectively be 7-bits or less if the measurement errors are large. Most computer displays have an automatic “Auto” function (button or menu selection) that attempts to do this pixel identification automatically. For most displays “Auto” generally does a pretty good job but seldom gets it exactly right, so most flat panel monitors and projectors with analog connections actually operate with a bit of fuzziness and noise, a fact that will probably shock most flat panel users. (Rescaling further magnifies these artifacts.) A manual adjustment of a pixel “Tracking” or “Phase” Control is necessary in order to get it exactly right and produce a perfectly sharp image. (Some displays are simply unable to get a perfect pixel lock.) All DisplayMate for Windows products include special proprietary “Pixel Tracking and Phase” test patterns that are used to accurately adjust and test the setting. There is an Auto pattern that will help the Auto function get as accurate a setting as possible and a more sensitive Manual pattern to help you adjust it as perfectly as possible. Video displays generally don’t provide any manual adjustments for pixel tracking or phase and rely exclusively on internal circuitry. That often leads to the artifacts discussed above but they’re not as objectionable or easy to see because video images are photographic in nature and are therefore relatively smooth to begin with. There are very few remaining sources that produce true native analog video signals so most analog video signals are actually generated from digital sources. One analog example is vidicon cameras, which produce a native analog signal but are now used only in specialized applications. (Most cameras are now digital CCD or CMOS based.) VCRs and older camcorders record analog signals but they generally use digital signal processing internally, so they are actually just another example of digital hybrids. It’s much easier to convert digital signals into analog than the opposite case discussed above. Very high quality analog signals can be produced by standard chipsets, but cost considerations may result in the use of lower performance components with reduced signal quality and the same video bandwidth, overshoot and ringing effects that were noted above. Both analog and digital signals are often encoded or compressed in order to reduce the requirements for transmitting or storing the images. Computer RGB analog signals are one of the few that don’t use any encoding or compression. DVI and HDMI are encoded for transmission but the digital signals are reconstituted exactly by the receiver. None of these signals generate any artifacts themselves, although they will transmit artifacts contained within the source material. NTSC and PAL video are examples of analog encoding and compression while MPEG and the new Windows Media Video are examples of digital compression. The compression is lossy so some image content is lost, which results in compression artifacts. The various compression algorithms produce varying artifacts at different compression levels. (They compete primarily on this issue.) In general, the greater the compression the greater the loss and the more apparent are the image artifacts, but the results vary with the algorithm. Compression produces various types of noise and intensity-scale contouring artifacts that are very similar in visual appearance to the various display technology artifacts that we’ve considered here. They will interact together, often magnifying the overall appearance of artifacts. In many cases the compression artifacts are visually indistinguishable from similar display artifacts. Almost all signal sources are now digitally generated, so they have an underlying pixel format and resolution, even when delivered as an analog signal. The format is always expressed in the form of total horizontal pixels by total vertical pixels, HxV. For example, computer based signal sources typically range from 640x480 up through 2048x1536 and MPEG video sources, including DVDs and digital television, are 720x480 for NTSC based systems and 720x576 for PAL based systems. High Definition Television signals have resolutions of 1280x720 and 1920x1080 (although these resolutions are not technically required by the ATSC standard, all current High Definition displays support them). All non-CRT based displays have a fixed digital pixel format, which is referred to as the native resolution of the display. For non-CRT computer displays, which are now primarily LCDs, the most common resolution formats are 1024x768, 1400x1050 and 1600x1200 for 4:3 Aspect Ratio screens, 1280x1024 for 5:4 Aspect Ratio and 1280x768 for 5:3 Aspect Ratio. For Enhanced or High Definition Television displays the most common resolution formats are 852x480, 1024x1024 (Plasmas with non-square pixels), 1280x720, 1365x768, 1386x788 (Sony projection LCDs), and 1920x1080, all with wide 16:9 Aspect Ratio screens. When the pixel format of the image or signal matches that of the display, there is a one to one correspondence so, in principle, it’s possible for the display to produce an image that is a perfect match to the source image. For computer images, which typically have fine text and graphics, this correspondence is essential in order to maintain critical image detail. Fortunately, computer graphics boards can be configured to support almost any resolution format that is required by a display, although manufacturers generally support only the most popular ones. Specialized utilities, like PowerStrip (www.entechtaiwan.net), allow most graphics boards to be programmed for almost any resolution that the hardware is capable of supporting. For video, on the other hand, the agreement between signal source and display native resolution is unfortunately not good. If you compare the resolutions listed above, there are only two out of six matches: 1280x720 and 1920x1080. When the pixel format of a signal or image doesn’t exactly match the display’s own native pixel format then the image needs to be rescaled up or down to match that format. Otherwise the image will overfill or underfill the screen. To accomplish the rescaling for a display with digital pixels the image pixels must be digitally interpolated and then resampled to the display’s native pixel format. For example, consider rescaling a 720x480 DVD image into 1280x720, one line at a time, the simplest case. (Sophisticated algorithms will use several lines.) No matter how you try to do it, there will be periodic irregularities (that show up as visual artifacts) in mapping 720 pixels into 1280 pixels, and they will be quite noticeable whenever there is fine image detail. Note that there is always a loss of sharpness with rescaling because image pixels are combined by varying amounts. Rescaling also produces increased pixelation artifacts. Because rescaling produces severe artifacts, the image must then be filtered in order to help reduce the irregularities. Filters try to smooth over the irregularities while maintaining as much sharpness as possible. They work by adjusting the intensity values of neighboring pixels. Many displays provide a choice of several different filters so you can pick the best compromise based on the image content and structure and your visual preferences. Advanced filtering techniques are a very important component to high quality rescaling. There are many different rescaling and filtering algorithms in use, so there will be huge differences in the quality of the rescaled images between displays. While rescaling has improved dramatically over the last 10 years there are fundamental mathematical limitations that restrict the accuracy and quality of a rescaled digital image, so a rescaled image will always be lower in quality than the original. This is true whether the signal is up-converted to a higher resolution, or down-converted to a lower resolution. Since most video images are photographic in nature, they are already relatively fuzzy and smooth, so the rescaling artifacts are not as apparent as in computer graphics images. Given the resolution format mismatches above, rescaling is the rule rather than the exception in video. In many cases both the signal source and the display are capable of rescaling the image. The most important point is to avoid double rescaling. This will happen if the signal source cannot rescale directly to the native mode of the display. The display will then be forced to perform a second rescaling, which should be avoided because of the additional artifacts and image degradation. As an example, if you have a DVD player that can rescale the image up to 1280x720, turn this feature off unless you have a 1280x720 display, such as in many current DLP displays and projectors. If you have two or more components that can rescale the image make sure that you try each one separately to determine which one does the best job. DisplayMate includes a large selection of test patterns that can be used to examine the accuracy of the image rescaling and the resulting artifacts. The Multimedia Edition’s “Moiré Montage” test pattern is the ultimate test of rescaling artifacts. It includes 12 different dither patterns that visually demonstrate how the pixels are redistributed and merged together after rescaling. Other test patterns, like resolution, focus and fine text can be used to visually evaluate the effects of rescaling. Noise is any seemingly random variation in image content that doesn’t belong (static or time varying) and there are many possible sources. One that is always present is from the image or signal source. In video it can arise from the camera sensor, grain in the film, a poor quality transfer, or encoding and compression artifacts. Composite video signals also produce various cross-color interference patterns, which are a form of image noise. Computer generated images, on the other hand, generally have exceptionally low noise in analog signal modes and zero noise in digital signal modes. If noise is visible from an analog computer signal source, it’s generally the result of analog electrical interference from other analog or digital signals inside the computer. In analog displays like the CRT, noise tends to automatically cancel out through temporal and spatial averaging because of its random nature. This makes the noise much less visually apparent. On the other hand, most digital displays will magnify the appearance of analog signal noise because they sample the signal, so the noise component becomes pixelated. Also, the noise component in an analog signal generally averages out to zero at each point in the image within a few frame times, but digital sampling will generally not produce a series of digital values that average out to zero, which increases the visibility of the noise. These effects were visually apparent in all of the flat panel displays. Digital rescaling further magnifies the noise. These noise artifacts are a major reason why poor signal quality images (such as standard definition broadcast NTSC video) typically look better on analog CRTs rather than on digital pixel displays. (Enhanced digital signal processing and filtering methods are closing the gap.) Once an analog to digital conversion takes place no additional noise propagation can occur, although the digital signal can become distorted through signal processing (see below). A source of image noise for displays that use digital intensity control, like the Plasma and DLP technologies, is Pulse Width Modulation (PWM), which generates the gray-scale by rapidly switching the pixels between on and off states and varying the percentage of time that is spent in each state. The eye responds to the time-averaged brightness of the pixel. This process is a form of temporal dithering. The switching frequency is fairly high, typically up to 60,000 clock cycles per second (60 kHz). That’s generally too fast for the eye to notice, but at low intensities a pixel will spend most of its time in the off state, so the occasional switch to the on state becomes noticeable as a form of switching noise. With this method it’s possible to produce between 8 and 10-bit digital intensity scales, with 256 to 1024 levels, at standard video frame rates. In some implementations the PWM cycle time extends down to 24 frames per second (fps), which is lower than the 60 fps rate of the video signal. This increases the number of intensity levels that can be generated but increases the visibility of the PWM noise patterns and may also introduce some visible flicker into the image. In some cases a digital display may not be able to generate all of the required (or desired) intensity levels. For example, in an 8-bit digital intensity scale, there may be duplicates or gaps in some of the 256 levels produced by the display device. (This is sometimes an issue over only a portion of the gray-scale as the result of an irregular Transfer Characteristic for the display device, which is typical for LCD and LCoS technologies). To overcome this limitation the display electronics is configured to automatically adjust the intensities of neighboring pixels so their combined intensities average out to the desired values. This procedure is called spatial dithering and it increases the gray-scale resolution. Image sharpness is reduced somewhat in return for a smoother gray-scale and reduced intensity contouring. It’s used in most Plasma and DLP displays and in some LCDs, but never in CRTs because they already produce a perfectly smooth intensity scale. Spatial dithering typically provides an additional 2-bits of intensity resolution. The averaging process may involve only adjacent pixels or it can encompass larger groupings of nearby pixels in order to produce a finer intensity scale. The dithering process introduces a form of spatial noise into the image. The dithering algorithm may involve a fixed pixel pattern, which is often more noticeable because it tends to produce repeating pixel patterns on the screen, or error diffusion, which generates a seemingly random pattern and a finer intensity scale, but also introduces more random noise into the image. In some cases displays will provide a menu option to choose among several dithering algorithms. In some cases a perfect end-to-end digital signal train may produce an image that is so “clean” that all of the artifacts that we discuss here will become quite noticeable. In that case using a high quality analog signal connection may instead produce a better looking picture because the analog noise will soften and obscure many of the artifacts. In general, it’s a good idea to compare both methods to see which one works the best. Since that will vary with the source material, it’s best to permanently maintain connections for both types of signals. Although they are often misused, Sharpness and Noise Controls serve a very important function in improving image and picture quality on all displays. For analog signals, the Sharpness Control can help to restore high frequencies (which produce fine image detail) that have been lost somewhere along the signal path. This can arise from mediocre performance in the signal source or the display electronics. Also, long cable runs and/or poor quality cables attenuate the high frequencies more than the low frequencies. The Sharpness Control increases or decreases the amplitude of the high frequencies (similar to the peaking circuits discussed under Signal Quality). The trick is not to overdo it, which introduces spurious edge artifacts and magnifies signal noise. DisplayMate for Windows Multimedia Edition includes a Video Bandwidth Index test pattern that allows the Sharpness Control to be set very accurately. In many cases the analog signal is intentionally optimized to look best on medium or low performance displays (that make up most of the market), which generally do not have very good sharpness. This is done by applying excessive high-frequency peaking and edge enhancement. It may be implemented in the signal source hardware (computer graphics board or DVD player) or through processing of the image content by the content creator (or both). Unfortunately, high quality displays with excellent sharpness will then show peaking and edge artifacts. The solution is to turn down the Sharpness Control from its default setting, which will improve, but not eliminate the artifacts. CRTs benefit from a specialized sharpness control, called an Aperture Control. Even if the CRT display has perfect electronics, image sharpness is reduced because the CRT’s beam has a significant diameter (aperture) that smears the image detail as it’s being drawn on the screen. The Aperture Control helps correct for this effect. Digital signals should not, in principle, need a Sharpness Control, since that function should have been taken care of by the creator of the image content. The problem is that the same digital output is used to generate the analog output signal, and that signal is often designed to be over-peaked so that the image looks sharper on lower performance displays. If that’s the case the digital signals will also be over-peaked and also show artifacts. If you find that to be the case, then lower the Sharpness Control in order to reduce the artifacts. Turning up a digital signal Sharpness Control is something that shouldn’t be done because much of the original signal information has been lost in digitizing and processing the signal, so even if it’s necessary the results won’t be very good. Turning down the Sharpness Control serves to reduce image noise. Many displays include a separate Noise Control that’s generally implemented through digital signal processing. Its primary function is to reduce specialized forms of noise, such as compression artifacts that show up as image noise. A motion artifact is any image irregularity that’s due to an image changing over time. This includes camera panning in addition to the motion of objects within the image. Some motion artifacts originate with the signal format; others arise from the manner in which the internal electronics updates the pixels in the display. Still others are due to inherent properties of the display technology itself. The most famous motion artifact is due to interlacing, where the odd and even lines in an image are transmitted a 60th of a second apart in NTSC systems and a 50th of a second in PAL systems. This results in some flicker and also a structured blur (called combing) when there is motion because the image is made up of components that were taken at different times. The solution is to use signal processing electronics to combine the odd and even sub-images into a single image that’s shown all at once and has double the scan rate. This is called deinterlacing (formerly line doubling). Special algorithms try to compensate for motion shifts within the image between the even and odd fields. While many displays include their own deinterlace processing, these motion artifacts have actually nothing to do with the display technology itself and are due entirely to the nature of the signal and the signal processing. Note that image quality on some displays may (surprisingly) decrease when they’re fed a non-interlaced (progressive scan) signal because the video bandwidth requirements are double those of an interlaced signal. Properly digitizing a progressive analog signal (including pixel tracking) is also twice as hard. So try it both ways. If the display’s deinterlacer is comparable in quality to that in your DVD player or other signal source then there is a reasonable chance that you’ll get better results with an interlaced signal input to the display. Most CRT computer displays and projectors can run at any frame (refresh) rate from 50 to 150 Hz or more, including the industry standard rates of 60, 72, 75 and 85 Hz. On the other hand almost all flat panel displays (computer or video) are designed to run internally at a fixed refresh rate of 60 Hz, regardless of the external frame or refresh rate of the signal that is provided. Many computer users mistakenly drive their flat panel monitors and projectors at 75 or 85 Hz because they’ve heard that it cuts down on flicker, but this works only for CRT displays. This just generates motion judder due to the same frame rate conversion artifacts discussed above. Worse it can needlessly decrease analog signal quality due to the video bandwidth and pixel tracking effects noted in the Signal Quality section. In order to go from 60 fps to 72 fps all of the display’s internal clock rates need to increase by exactly 20 percent for NTSC based systems (and 44 percent for PAL systems). The video bandwidth of the signal processing electronics also needs to go up by the same amount. This is a significant performance increase but it’s easily within the capabilities of current display technology. Hopefully we’ll see more video displays, projectors and DVD players in the near future that will be able to do 72 Hz and 3:3 Pulldown processing. Many display technologies with digital pixels will produce some form of artifact when there is motion in the image. This results from differences in how the pixels are updated from one frame to the next by the device electronics. In some digital displays the pixels are not all updated at the same time, but rather in cycles and/or zones. For example, the top and bottom halves of the screen may be updated separately or the odd and even lines may be updated separately, the latter a variation on interlacing, except that the input signal to the display is progressive rather than interlaced. You are more likely to see these artifacts in older or lower performance Plasma and LCD displays. These motion artifacts are most visible when the image contains fine detail. DisplayMate Multimedia Edition’s “Moiré Montage” with 12 different dither patterns is the ultimate test for these motion artifacts. Motion artifacts also arise when there is any form of temporal dithering that extends longer than the video frame time, such as in some implementations of Pulse Width Modulation, because the motion interrupts long switching cycles and thereby introduces some gray-scale contouring errors around portions of the image that are moving or changing. LCDs have their own special issues of motion smear due to a slower response time of the liquid crystal. On the other hand, CRTs are virtually immune from motion artifacts because they are analog devices and the phosphors have fast response times. Compare the photographs of a moving DisplayMate test pattern in Figure 2 for a CRT (top) and an LCD (bottom). These photographs were made using DisplayMate Multimedia with Motion Edition, which moves DisplayMate test patterns in varying directions and speeds in order to look for all sorts of motion artifacts. In the photographs the image was moving diagonally, from the lower right to the upper left. The photographs were made with a traditional film camera because digital cameras can introduce their own artifacts while capturing moving images on a display. Both displays were fed identical signals. Since the LCD is brighter than the CRT, the grays show up differently in the photographs. (This doesn’t affect the comparison.) Note that these photographs are not of the Sony CRT and NEC LCD that we measured in Parts I and II. A fair amount of signal processing must occur between the display’s signal input connectors (whether they’re analog or digital) and the display device. Any adjustment, correction or change in the image requires some sort of signal processing. For example, each of the user, service, factory and calibration controls modifies the signal in some way and therefore requires signal processing. Getting the display to produce the desired Gamma and gray-scale (see Part II) generally requires a considerable amount of processing. For analog signals it’s relatively simple (in principle) to implement the necessary signal processing because most of the controls merely involve a change in amplitude (gain) or bias (DC or black-level offset), but it takes very high quality engineering and components to do it well. The most complex analog circuitry is involved in producing the desired Gray-Scale and Gamma because it has to correct the non-linear variations in the display’s Transfer Characteristic. (Most CRTs generally don’t try to change their native Gamma and digital displays that accept analog signals will implement the Gamma correction digitally after the analog-to-digital conversion.) The biggest problem is that analog circuits are imprecise, and that leads to the artifacts discussed under Analog Signal Quality. The electronics for implementing digital signal processing are considerably more complex than analog signal processing. This is the main reason why most displays currently offer fewer controls with digital inputs than with analog inputs. For example, for the standard 8-bit 0-255 intensity scale that has 256 levels, merely increasing the black-level by 10 levels requires that the number 10 be digitally added to the intensity value for each pixel that is received by the display. The first problem is that this needs to be implemented in special image processing hardware. The second problem is that we automatically lose 10 intensity levels so there are now only 246 active levels on the 0-255 scale. A third problem arises if we wish to recover the now illegal values of 256 to 265 from the addition and restore them back to the 0-255 scale. To do this, it’s necessary to effectively multiply all of the signal intensity values by a factor of 255/265=0.962. (It can be done with fixed point arithmetic or a look-up table.) This is actually a rescaling of the intensity values and is equivalent to lowering the analog video gain using a Contrast Control. A fourth problem arises because the intensity scale has now acquired some irregularities (artifacts) because the former 256 steps are now remapped and squeezed into 246 steps, resulting in some visible 7-bit intensity-scale banding and false contouring. This same type of processing is required for each control pair that is implemented digitally: Brightness and Contrast, Red, Green and Blue Drive and Bias. More complex processing is required to implement Color Tint and Saturation Controls. Finally, additional processing is required to implement the desired Gray-Scale and Gamma (generally in the form of a look-up table). All of this can be done with custom image processing chips. However, each processing step in the chain results in a further loss of intensity levels and mathematical precision, so the cumulative errors can be quite large and produce severe artifacts that will be seen on screen. To prevent this from happening the internal signal processing should be done with more than the external 8-bit signal intensity scale. The greater the degree of processing required the finer the internal intensity scale that is needed internally. 10-bits is the minimum needed in order to restrain the 8-bit artifacts from growing too much as discussed in the Digital Granularity section above. We have discussed many different artifacts that affect the accuracy and granularity of a display’s intensity scale with digital signals. They all compound together and progressively accumulate to produce the final intensity scale that we see on the screen. Many of the irregularities are quasi-periodic and so they may interfere and beat against each other, which introduces additional moiré interference patterns on the intensity scale. Because of varying control settings and tolerances, the irregularities will be different for each of the Red, Green and Blue primary color channels, so the gray-scale may acquire a complex tinted structure due to the different rippling. All of these effects add false textures and contours into an image. The quality of the signal processing determines how noticeable these effects will be. CRTs as analog devices are immune to all of these artifacts. DisplayMate Multimedia Edition includes a large number of test patterns that can be used to check on the smoothness of the gray-scale and whether there are any irregularities in the form of contouring or banding. Varying the range and step size within a gray-scale allows all sorts of subtle patterns to be easily detected. Noise bands from Pulse Width Modulation are easy to detect in this way. The “Gray-Scale Tunnel” test pattern visually translates irregularities into virtual 3D spatial effects and is an excellent way of determining whether any of the artifacts will be noticeable on screen. In Part III we have discussed a wide range of artifacts than can affect the different display technologies. The underlying theme throughout has been analog versus digital. The real issue is not which one is better because they are both necessary, but rather how to make them perform as perfectly as possible together. Over the last few years analog video performance has slipped due to a move towards large-scale integration chips and away from the use of specialized high-performance components. The digital portion of the pie will continue to increase but it’s going to take a while to make all of the digital artifacts shrink to the point where they will become almost invisible. That will eventually call for 12-bit signals and 16-bit processing. As the bit-depth and number of levels increase digital processing will begin to behave more like a perfect scale-free and artifact-free analog system. The audio world has done a much better job in carefully integrating the analog and digital domains together and producing outstanding end-to-end system performance. Many of the technical issues are identical although the frequencies involved are more than a factor of a thousand apart. In Part IV we’ll continue with a discussion of specialized artifacts that apply to only one particular display technology and then analyze and assess each display technology in detail and tie together all of the results from Parts I to IV. Special thanks to Craig Verbeck of Pixelworks for discussions on signal processing, and to Joe Lee and Paul Wolf of Silicon Image for information on DVI and HDMI. Dr. Raymond Soneira is President of DisplayMate Technologies Corporation of Amherst, New Hampshire. He is a research scientist with a career that spans physics, computer science, and television system design. Dr. Soneira obtained his Ph.D. in Theoretical Physics from Princeton University, spent 5 years as a Long-Term Member of the world famous Institute for Advanced Study in Princeton, another 5 years as a Principal Investigator in the Computer Systems Research Laboratory at AT&T Bell Laboratories, and has also designed, tested, and installed color television broadcast equipment for the CBS Television Network Engineering and Development Department. He has authored over 35 research articles in scientific journals in physics and computer science, including Scientific American. If you have any comments or questions about the article, you can contact him at dtso.info@displaymate.com. Copyright © 1990-2005 by DisplayMate® Technologies Corporation. All Rights Reserved.